The physical demands from birthing plus the daily tasks of breast feeding, carrying and lifting a growing newborn can produce symptoms of muscle pain or tension in the hips, lower back, upper back, neck and shoulders. As a new mother, you may also be feeling emotionally stressed, tired and depleted of energy. 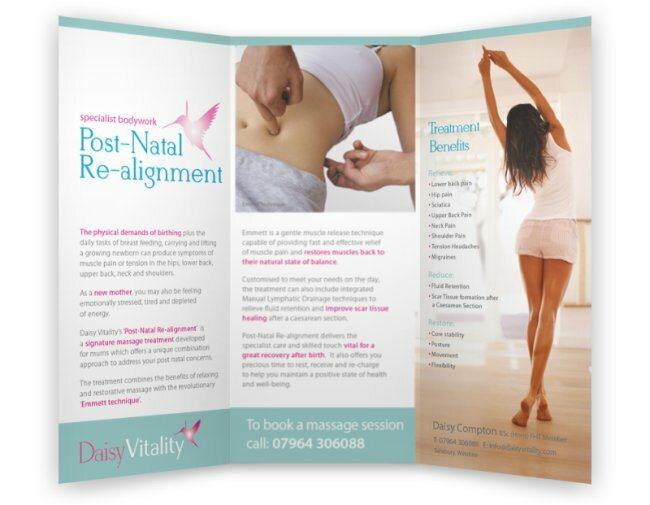 Daisy Vitality's Post Natal Re-alignment is a signature massage treatment developed for mums post birth, which offers a unique combination approach to address your post natal concerns. Benefits of Post Natal Re-alignment? Emmett is a gentle muscle release technique which can ease muscle pain, restore muscle balance in the lower back and pelvis, and increase your core stability after birth. Your Post Natal Re-alignment treatment will be customised to meet your needs on the day, and can also include integrated Manual Lymphatic Drainage techniques to help relieve fluid retention and improve scar tissue healing after a caesarean section. re-charge to help you maintain a positive state of health and well-being.